Soaring 40 stories into the Manhattan skyline, Knickerbocker Plaza is an elegant post-war residential tower, offering breathtaking views and an unrivaled level of service to its residents. Tucked away from the hustle and bustle of midtown, Knickerbocker Plaza is an oasis of tranquility in the city that never sleeps. The imposing structure, built in 1975, is comprised of 576 stylish residencies ranging from studios to three-bedroom apartments. The on-site conveniences include a leasing office and a Northeast Bank with an ATM machine. The full-time building management team is just a block away, available to assist residents with a wide range of needs. A host of superior amenities, including a 24-hour concierge, a full-time doorman and a parking garage, reflect the lifestyle and expectations of the Knickerbocker Plaza residents. The spacious lobby greets visitors with warmth, light and elegance. Adjacent to the building is the private lane on 91st Street, serving as a calm reprieve in a park-like setting. The recreational area, somewhat resembling Gramercy Park, is open to pedestrians only…the ideal place to relax and unwind from the hectic city life. Plus, there is a beautiful public park right across the street. Conveniently set along 2nd Avenue and 92nd Street, Knickerbocker Plaza is a few minutes away from high-end designer stores, the renowned Courtyard Hotel, and some of Manhattan’s trendiest restaurants. In addition, tenants enjoy quick and easy access to public transportation, the East 90th Street Ferry Terminal, and numerous medical facilities. 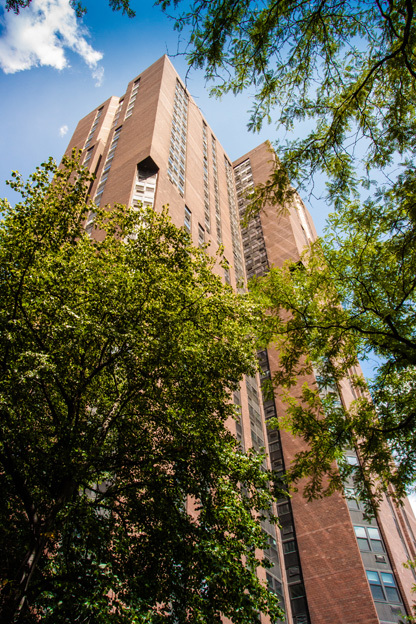 The high-rise is just a block away from the New York Sports Club, the U.S Post Office, Kings Pharmacy, and Hallmark Cards and Gifts. At Knickerbocker Plaza residents take refuge in the solitude of the Upper East Side, while being at the doorstep of the busiest and most exciting city in the world.